Come and join the many creative courses and workshops. Learn an array of sewing skills ranging from basic to advanced or brush up on your pattern making. Create a silk painted scarf or try one of our embroidery, beading or floristry courses. We would love to welcome you to our friendly, relaxing, beautiful space run by professional artists and designers, based in Peter’s Green, Hertfordshire. This class is aimed at people with a no previous knowledge of embroidery. Worked in a stylish palette of black and gold with an accent in pink, this tambour beading class was inspiredby organic and graceful flowing lines of the Art Nouveau period. Tambour beading, once mastered is a quick method of applying beads and sequins. Used widely within the fashion industry to create the glamorous gowns you see on the red carpet, this addictive technique will have you wanting to embellish everything you own with beads and sequins. 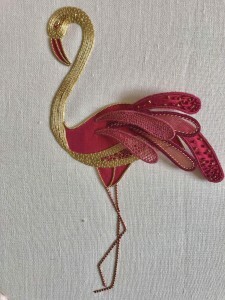 You will learn how to start and finish the thread, create the basic chain stitch, then following on with how to apply beads, sequins and turn corners. Each embroidery kit has been lovingly packed in a beautiful presentation box by Sara and includes all the materials you will need to complete the embroidery. It also includes a detailed instruction booklet to help guide you, so you can finish the piece at home. Please note this kit DOES NOT include the tambour hook and holder. These can be purchased or borrowed on the day. Finished size of the embroidery is 22.5 x 12cm. This class is aimed at people with a basic knowledge of embroidery. Worked in a palette of soft greys and silvers, this brooch was inspired by the recent Balenciaga exhibition held at the V&A museum where Sara also taught this class. 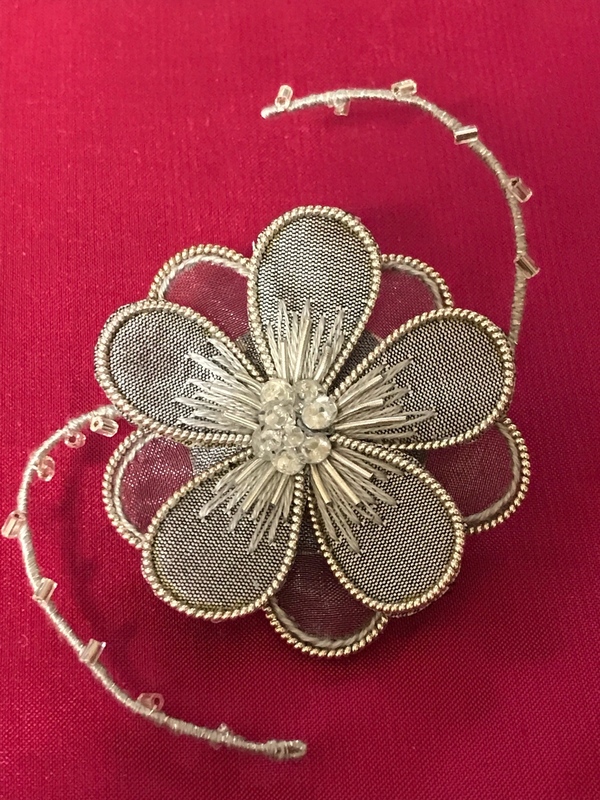 Learn how to apply Pearl purl to silk and organza, how to apply beads and sequins along with how to make the wired tendrils, finishing everything off with how to make each separate petal and combine them into one stunning brooch that you can wear home. Each embroidery kit has been lovingly packed in a beautiful presentation box by Sara and includes all the materials you will need to complete the brooch. It also includes a detailed instruction booklet to help guide you, should you need to finish the brooch at home. Finished size of the embroidered brooch is 7.5cm. 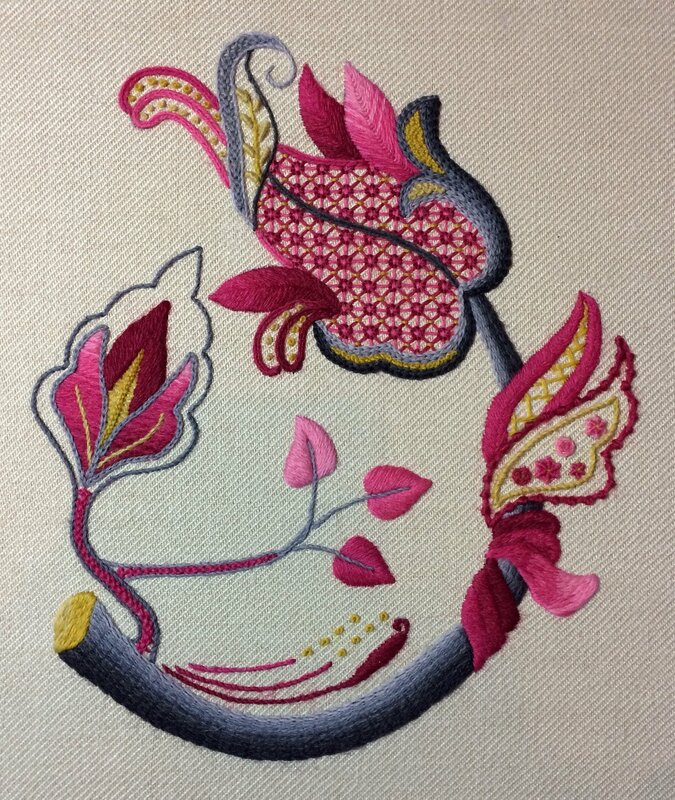 This class is aimed at people with a good understanding of basic embroidery stitches. Worked in a palette of vibrant pink and gold onto a cream linen, this stumpwork flamingo was inspired by the tropical Caribbean and a sure fire way to brighten up your day. 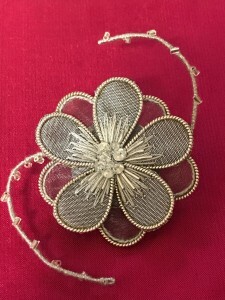 You will learn a wide range of embroidery techniques such as how to create three dimensional wired wings filled with needlelace, metal work chips, and overstretched Pearl Purl, which will then be applied to the main fabric. You will then learn one method of how to apply fabric and felt padding for goldwork. Couched passing, chip work, and stitching down Pearl Purl will also be taught. Finished size of the embroidery is 17 x 12cm. Please note this kit DOES NOTinclude the tambour hook and holder. These can be purchased or borrowed on the day. Worked in a paired down palette of pink and grey with a yellow accent, this Crewelwork embroidery is a modern twist on the traditional Jacobean style. You will learn a full range of Jacobean crewelwork stitches, including, raised stem band, raised chain band, padded satin, long and short, stem stitch, French knots, trellis, chain stitch, fishbone, closed fly stitch, bullion knots, Vandyke, whipped wheel, woven wheel, heavy chain, coral stitch among others. Finished size of the embroidery is 17 x 15cm.